In beautiful mid-October, I traded in my ankle booties for sandals (definitely do not call them flip flops) and headed to the West Coast for the first time. And though I’m not rushing to give up my East Coast home, I definitely loved the California weather and scenery. Here are (IMHO) five places you simply must see when you Go San Diego! The beautiful, tiny island is where we spent most of our time. Over the glittering bridge from the mainland sits the charming hub of culture and charm that is Coronado. You must rent a bike and take one of the paths for a spin and get a real look at the Crown City. We rode for hours and were stoked to see the unique housing stock. Coronado looks like 100 people from 100 different cities moved there… and took their houses with them. We saw Malibu bungalows next to Victorian manors and super modern structures. And did I mention everything is within a block of the ocean (and a golf course, and a yacht club if we’re being honest)? We stayed at the Marriott Coronado Island Resort and wow. If you can’t stay there, take a walk on the boardwalk and just eat breakfast there. You’ll likely be joined by local birds who stop by for a taste of your jam. Best part of this place? The hammocks with ocean breezes. I could have stayed forever. I know you remember that name from your middle school days of Hollister Co. sweatshirts. Everyone talks about La Jolla (pronounced la-hoy-ya), and for good reason. The town of major Hispanic influence is worth a stop. There is an awesome shop to rent gear for snorkeling and surfing. It was too cold for us to go in without wetsuits but the waves made the trip worthwhile for Jake. Take time to stop at Galaxy Taco when you’re done your day of adventures. The owner brings in fresh blue corn every day from Mexico for the homemade street tacos’ base. Yum! A few minutes Uber outside downtown is the Seaport Village, home to artisanal and souvenir shops for all of your touristy needs. Be sure to stop for a cupcake at Frost Me! They don’t have a huge selection of flavors but the Nutella centers are so rich you won’t care. Definitely stop into Hot Licks, the most expansive hot sauce shop I’ve ever seen. The husband and wife team carries a lot of authentic Mexican sauces, as well as their own line. San Diego is a fairly new city and that means it had a little more sophisticated urban planning than say, Philly. Needless to say, all the cultural centers are together in an area outside downtown called Balboa Park. One of the premier zoos in the world, San Diego is more of an experience. I don’t think we got through more than half of the exhibits in the day we spent there but we had a really good time. You’re admitted with a fancy, collectible ticket and board a double decker tour bus that takes you around the whole zoo. This zoo has EVERYTHING. Sculptures, great food, an IMAX theatre, and the most amazing habitats I’ve ever seen. The animals can be viewed from so many angles and their enclosures are so open, natural and big that I can’t imagine they even know people are watching. This post can’t even begin to scratch the surface of the amazing trip we had. From the awesome food at Harbor Breakfast where we sat at the counter with locals (and their pooches) to the mall at Westfield Horton Plaza that looks like it popped out of a Dreamworks film. To the chic Burger King with an outdoor patio and me finally buying my very own Rainbows! The best part of the trip really was getting to spend time with amazing family and celebrating a brand new marriage. It was the trip of a lifetime and really gave me the itch to order new luggage and keep on track with Mint so I can go out and travel more. Are you from San Diego? What awesome places didn’t make my list? Tell me in the comments below. This weekend I went on a girls getaway with my high school friends. What a blast from the past it was to spend time together again, reminiscing and reconnecting. At the persuasion of a friend who vacationed there as a child, and being Philly rats, we decided to head up the PA Turnpike and explore the beautiful hills of Elysburg, PA and its shining gem, Knoebels. I remember being a kid and my dad talking about the amusement park where “every ride’s a dollar”. Compared to the price gouging at the Jersey Shore, that price was downright foreign. We never did make the 2.5 hour trek from the city up to Elysburg so I jumped at the chance to go as an adult. Elysburg is nestled in the hills of upstate PA, settled around the major attraction, Knoebels. Knoebels is the self-declared “largest free-admission amusement park” in the country, and perhaps one of the oldest. This charming village feels like a less doctored up version of Busch Gardens, which I actually preferred. For families, this struck me as the spot to plan a memorable, affordable vacation. Knoebels has no admission fee! You can buy a ride band or books of tickets, like a carnival. So grandma can totally come along for the memories and avoid paying just to get in. All are welcome to use the luncheon pavilions, watch the live entertainment, and take photos at the historic sites. The rides are super affordable! They may not all be a dollar a ride anymore but they average less than $2 per attraction. If you have a group, do the math and figure out if you’ll need more than $150 in tickets. You can buy them all together and receive up to 15% off! There are always special deals happening too, like 90 cent Sundays and $12 Fridays so plan your trip around the online calendar. There are over 2 dozen eateries in the park! From novelties like candy floss and apple cider slushies to pizza, grilled chicken sandwiches and walking tacos, there is something to suit every palette. Even the food was affordable with a generous burger averaging $3.75 and a large pizza at $12. If eating at the park isn’t for you (saving money, picky eaters, food allergies), that’s ok too! You can bring in a cooler and use the covered lunch pavilions just the same. Since there is no admission fee, there’s no place to check in and no rules on carrying in water, food, or lactation products. There’s way more than just rides! Live music, magicians, shops, story time and a pool round out this vacation spot. Best yet, the live entertainment is always free and a pool pass can be purchased for less than $10. There are even two free museums on the premises. Knoebels has a lot of cool, old-fashioned rides. There were so many unique, war-era coasters and attractions. The intensity level is lower than Great Adventure and was more on par with Disney so even scaredy cats like myself could get in on the fun. Knoebels offers free parking! They also have a tram car that comes around the huge lot to get you right up to the park without having to walk (also free). You can stay here too! Tent out, rent a cottage or stay in a cabin- it’s up to you! But all accommodations are connected to or within a ten minute shuttle ride of the park (and yes, the shuttle is also free). Leave money for souvenirs at the gift shop and to take home some fresh fudge or caramel corn and you can make this trip happen for about $450 for a family of 4 (in the highest priced cabin)! PS: Is Knoebels your family vay-kay of choice? Tell me your favorite Knoebels memory in the comments below. My next journey is in the works and it is to *drumroll please*…Montreal! In reality, I would love to go France this year but neither my budget nor my schedule will allow it until next summer. Montreal is much closer to home, takes less travel time, and costs a lot less so it is the next best option. 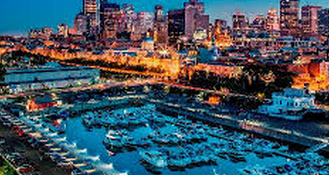 Montreal is a large French-speaking colony in southeastern Canada, less than two hours from the US border. With its culture and tiny streets, it feels like Europe. Being close to home has its perks: English speakers aplenty, similar currency rates, and a short flight. As far as attractions go, the city has enough to keep someone as active as myself busy for a solid three to four days. I am not one to sleep-in during vacations in cities as culturally rich as Montreal- naps are for the Bahamas. Continuing into food, I hear I must try poutine, basically fries with cheese and gravy on them. Also, local beer, honey, and smoked meat sandwiches. And surprise- bagels?! I will live to see and eat these Montrealian bagels. For around $50 you can even take a food tour of the Plateau neighborhood which is apparently the hipster center of the city. There is also great shopping to be had down various main streets and there is a huge underground mall. You know you are in a cold, snowy climate when it was more economical to build an entire mall underground than to clear and salt the roads for the season. 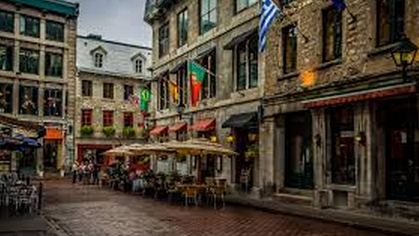 The Old Port area also has culture to be explored, including small BYOBs, tiny boutiques, and the Grevin Wax Museum. Add that in with the downtown area’s jumping club scene and I see the recipe for an awesome long weekend. That brings us to a grand total of $436! Make sure to consider money for food and souvenirs. I tend to be on the low end of that because my favorite souvenirs are memories, pictures, and postcards. Plus, I enjoy buying at local markets and cooking. As far as AirBNB, I like having a home instead of a hotel. You get a lot more for your money and the guides are generally more than happy to help with directions, suggestions, and sometimes even family dinners or rides to the airport (score!) For my own reassurance, I choose to travel with friends, rent an entire apartment (not a room), and I only go with “Superhosts” (preferred hosts, screened through AirBNB) whenever possible. If anyone has been to the land of the Maples or is a current ‘Trealiar, please comment below with suggestions!